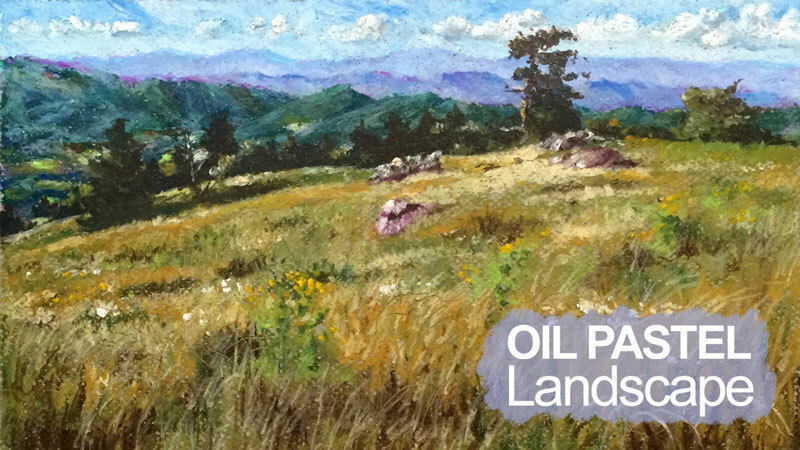 A four-part series on drawing a landscape with oil pastels. Techniques for creating the illusion of space and applying oil pastels are covered. Develop a thick application of the medium, working from the background to the foreground. Create the impression of brushstrokes and learn how oil pastels can be used in a painterly, Impressionistic manner. Every step of the process is demonstrated and commentated as decisions are made that affect the overall composition and color scheme of the finished work. Four hours of instruction is included with this series. No, the oil pastels never dry completely and therefore never harden. Sorry, but I can just barely hear your audio! I use an Apple MacBook and have the volume levels all the way up. I do enjoy your teaching and hopefully the problem with the audio will improve! Check and make sure that you have the audio turned up on the player as well. There should be blue colored bars in the lower right hand corner of the player when you scroll over it. Make sure that all five of them are colored in. If they aren’t, click on them to turn up the volume. I get an error that says the page doesn’t exist. Everything seems to be working normally. Where are seeing this message? I wonder about using an actual blender pencil, for blending? Do you know anything about a brand of oil pastels called Staedtler, or Pentel can you mix both together?